Zoe Kravitz was literally brought up where the spotlight was brightest; she is one of Hollywood celebrity actresses who became famous because they had well-to-do parents who are not just rich but also very popular among the celebrity crowd. In addition to acting, Zoe also banks as a model and singer. She was born in Los Angeles, California, in the U.S, on December 1, 1988. If there’s one thing Zoe Kravitz is known for in the showbiz circle, it is her relationship with actress Lisa Bonet and veteran singer Lenny Kravitz, who are her celebrity parents. Kravitz’s dad, Lenny, is a Grammy Award-winning record producer/singer/actor/songwriter best known for his varied music genres, which include funk rock, rock, hard rock, neo-soul, and neo-psychedelia. He was born to an actress mother who goes by the name Roxie Roker and a news producer father Sy Kravitz. Lenny’s real name is Leonard Albert Kravitz. He was born on the 26th day of May 1964, in Manhattan, New York City, New York. He is the only child of his parents and has a mixed racial background. He is Russian Jewish from his father’s side and Bahamian and African-American from his mother’s side. Lenny Kravitz has been active in the music industry since 1981. Apart from singing, he plays guitar, drums, keyboard, harmonica, piano, and percussion very well. Zoe Kravitz’s mother is a seasoned actress famed for portraying the fictional character Denise Huxtable in the television series The Cosby Show. Born in San Francisco, California, on November 16, 1967, to Allen Bonet, a Texas-born African-American opera singer and a music teacher mother called Arlene Bonet, Lisa kicked off her professional acting career in the year 1982. She is a former child actress and has appeared in a slew of Hollywood movies and television series. Lenny and Lisa met at a New Edition music concert in 1985 and later became friends. The pair eventually fell in love with each other after two years of blissful friendship. Lenny later relocated to New York City and moved in with Lisa in her apartment. The two would tie the knot in Las Vegas on November 16, 1987, and welcomed their first child, Zoë Isabella Kravitz, on December 1, 1988. Five years after Zoe arrived, Lisa and Lenny divorced amicably. Ever since the veteran singer divorced his wife, he has been in a slew of relationships with different women. His first open relationship was with Australian-British singer Kylie Minogue, after which he dated French model/singer/actress/songwriter Vanessa Paradis. He has also been linked with Adriana Lima, a Brazilian model he dated in 2001 and later got engaged to in 2002. Lenny later called off his engagement to Lima and would date Australian actress/producer Nicole Mary Kidman from 2003 to 2004. Given the fact that Zoe is young, beautiful, talented, and has influential parents, we are not surprised that she has a long dating history. Considering the fact that she also comes from a family of varied showbusiness talents, it’s no news that she has come across men of various sizes and shapes. 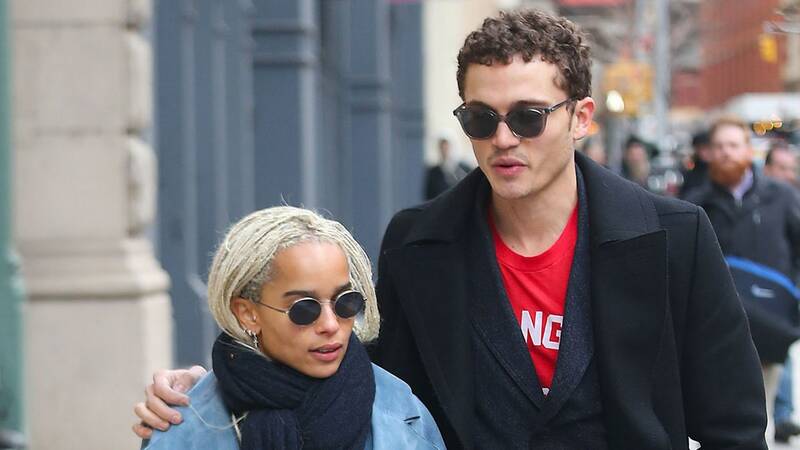 Zoe is currently dating Hollywood actor Karl Glusman and had previously dated Los Angles-born actor Chris Pine and German-Irish movie star Michael Fassbender. Other stars who were once an item with Lenny Kravitz’s only child are Canadian entrepreneur/rapper/singer Aubrey Drake Graham, popularly known as Drake, and Barbara Becker’s son, Noah Gabriel Becker. Kravitz’s current boyfriend, Glusman, was born in The Bronx, New York City, New York, on January 3, 1988. He made his debut film appearance in the 2008 movie The Iconographer but he is best known for his role as Murphy in the 2015 movie Love. With a career spanning over a decade, Zoe Kravitz boasts a sizeable net worth estimated to be $4 million. It is believed that she made her money from her involvements in the showbusiness circle as a singer, actress, and model. The Los-Angeles-born superstar also has her own jewelry line as well as music bands called Lolawolf (founded in 2013) and Elevator Fight (founded in 2009). Zoe Kravitz is blessed with an incredible curve as well as amazing body features that make her outstanding as a model. The Hollywood star stands at a height of 157 centimeters (5 ft 2) and weighs 51 kg (112 pounds). Details of her body measurements are – Waist size: 64 cm (25 inches); Breast size: 87 cm (34 inches), and Hips: 89 cm (35 inches). Her dress size is 6 US (36 EU) while her shoe size is 7 US (37 EU).